In this post, you can expect: sewing, fabric and quilty inspiration; some Swiss travel, and finally, the most important thing….. food! Please note that I will put any relevant links at the end of the post. My beginner, garment sewing class is really inspiring, and I am learning so much. So far I’ve learned about: sewing machine feet, appropriate stitches, basic seams and hems, a serger etc. In addition, I’ve been learning to make my own pattern, as I sometimes have an existing piece that I want to copy. I am especially enjoying learning to sew on this wonderful machine, the school provides : a Bernina B530. I would recommend it to any beginner sewist or quilter. I’m so glad I have only ever sewn on Berninas, as understanding basically how it works, and its parts made it so much easier. Bernina is a big brand here and buying any other, would have been only foolish, since they are so readily available, and are made here in Switzerland. There is also a Bernina dealership in St. Gallen, where I live. Which is great because, during the course, I get 10% off everything, which comes in handy, when you just bought an expensive machine and you need the extra feet and notions for the course. In last Thursday’s class, I started my first maternity belt. I need that more right now, than baby clothes. The maternity belt (which I was given by a friend) was so comfortable and practical, I had to make more myself. I didn’t feel like tracking them down and paying the 20 bucks, when I could just make one, for a fraction of the cost. As the belt, is fairly straightforward looking I thought it must be easy enough to reproduce. It’s fairly easy, providing you have a little guidance, as I did from my excellent teacher. Following the course, I took a train to Solothurn, to visit friends. It was exhausting for me (as you can probably tell), but straightforward. The Jamaicans made up for it, by spoiling me with a nice sweet potato and chicken soup. On Friday, I checked out this little gem of a store, in nearby Selzach, called Blue B. It sold mainly jersey fabrics for kids, but I also found some beautiful fabric for me too! The store offered classes and supplies for various crafts. Next, we headed to Cotton & Color in Riehen, Basel. I thoroughly enjoyed, what must be my third visit, and I can’t wait to go again. The pictures pretty much speak for themselves. The store specializes in quilting fabric: both cotton, flannel, and a little wool; though they also had a little decorating fabric. As their concept is color, their fabrics are naturally organized this way. I find this great if you are looking for a specific color, but if you are searching for a specific fabric to match your quilt, maybe from a specific designer, it can be a bit overwhelming. I imagine their main business is done online, as I have witnessed in my different visits, that they have customers from all over Europe. They have an excellent website to back up their color concept. It even has a design board, where you can group fabrics together, that you want to work with. I was lucky enough to get a quick tutorial, from the owner on how to use it. As usual, on my way home, I stopped off in the neighboring German village of Inzlingen, Germany. Should you decide to visit the shop, and need somewhere to stay overnight, or simply eat, I would highly recommend the village hotel: Hotel Krone. The hotel is a small, but decent, business hotel, offering simple rooms, and its own trendy restaurant, which serves delicious breakfasts, and warm meals throughout the day. Needing to stretch my legs and enjoy the wonderful fall weather, I took a lovely little walk around the moted mini-castle and up above the village. I posted an early post about a previous visit to the shop and area, here. Unfortunately, I forgot my phone and so can only share my last visit in September, on my way back from the Alsace quilt show. Back in Solothurn, we celebrated an early, Thanksgiving, just for us 3. With our busy day, there was no time for the trimmings, so we kept it easy: roasted vegetables and potatoes, with a small roast chicken. (My friend can’t eat Turkey). Saturday, hubby joined us. His mode of transport: a three-hour drive + a four-hour hike. Our destination was the Creux du Van in Canton Neuchatel, on the French border. Of course, the Jamaican’s and the pregnant lady weren’t going to have any of that ‘hiking’ business. We drove to the top. … and the mountain ‘hut’ like atmosphere of the Le Soliat Restaurant, were definitely worth a visit, and I’m sure we will all go back again. Their culinary offerings can be seen on the chalk boards before you enter the restaurant. Inside Le Soliat Restaurant awaited a delectably cozy atmosphere, unlike anything I’ve ever seen here in Switzerland and the other nearby Eastern Alpine areas. Yves and Horace chose the cheese fondue of course; the perfect meal for a cold November day. There’s my Jamaican family in Switzerland- Horace and Kemi, along with my husband, the ragged looking one with his trusty Apple Cider in his hands. If you can read German, or would like to see Yves’ amazing pictures of the wonderful wildlife he encountered on his hike, you can visit his hikr.org blog. See the link at the end of this post. I must say I am very jealous I, yet again missed out on up-close encounters with Steinböcke (Swiss mountain animals which translates to Ibexes in English). I can’t believe he got such amazing pictures of these cute as buttons, Ibex babies, and their family. It’s definitely worth a peek at his posts photos. Before we agreed to come, we had to make Horace promise, he would make his delicious Tamarind Chicken. And thankfully, he granted us this wish. I even got my own, private cooking class! 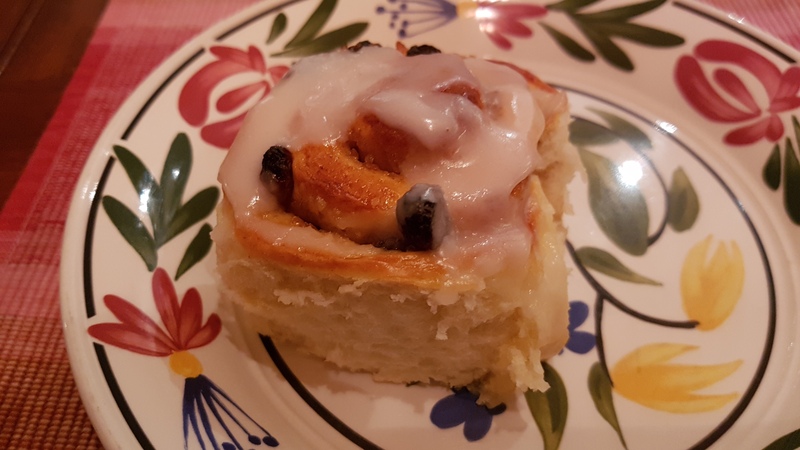 For dessert, Kemi made her delicious, cinnamon & raisin rolls. She had just got, her long-awaited Kitchen Aid, and somehow you could taste the difference, as her rolls never tasted as light and fluffy! The next day we headed home, but not without a delicious Sunday breakfast. So that brings me to the end of this post. You will need to stay tuned to see my fabric and quilty haul from the two visits to the fabric and quilt shop, as well as my progress on the maternity belt, which I’ve been making alterations to today. You can stay tuned on Instagram or here on this blog. See the follow buttons on my blog page. If you have any comments or corrections to be made to this post, please let me know. I was really sorry I wasn’t at the quilt shop with you and Kemi. It bought back a lot of memories. I’m sure you would have enjoyed it too!!! We’ll go there again, I’m sure, sometime in the future!! I’m so enjoying following your adventures. Thank you for taking us with you via your blog! Well I’m glad Carole! Please feel free to stop in again, anytime, for more of my little adventures!